I don’t usually go Gaga over ceramics (well, wait, yes I do! ), but when we added this image to our collection I had a “never knew that” moment. Most art history texts cover the ancient Egyptians from pre-dynastic times (Narmer, for example, ca. 3150–3125 bce). This vase dates from slightly before that. What struck me about this vase is the timeless quality of it. 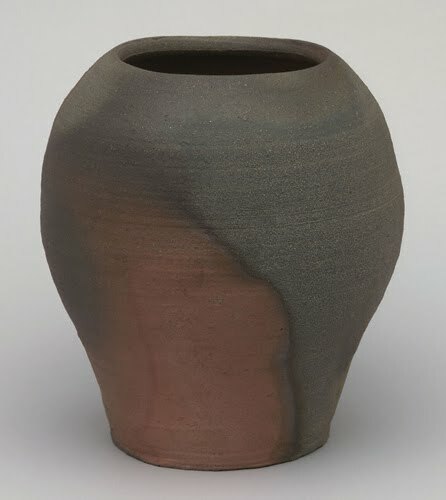 It not only resembles Zen pottery from Japan from the 14th century on, but also of contemporary ceramic artists. That being said, look at the beautiful form! This was done by hand without the potter’s wheel (which emerged in Egypt in the 2000s bce)! This vase could totally be considered “modern”! There is evidence of agricultural, fishing, and herding cultures as early as 5500 bce in Egypt. Also, these early cultures in Egypt seem to have laid the groundwork for later cultural customs. The Badarian culture is named after the area El-Badari, Asyut, which is in Upper Egypt. It is the earliest known non-nomadic culture in Egypt of the pre-dynastic period (dynasty one dates to 2920 bce). What fascinates me is that this early Egyptian culture was already performing burial rituals that became the dominant impetus for art in subsequent Egyptian periods. People were buried in shallow graves, often wrapped in papyrus mats, surrounded by objects that were perceived to be needed in the afterlife, such as vases like this filled with food and personal possessions. The bodies were usually buried in the fetal position, oriented north/south, but always with the face turned towards the West. In Egypt, the west—where the sun set— was considered the realm of the afterlife (eventually where Osiris ruled). Imagine spiritual beliefs that lasted 4000 years! This clay vessel was most likely fired in an open pit kiln. 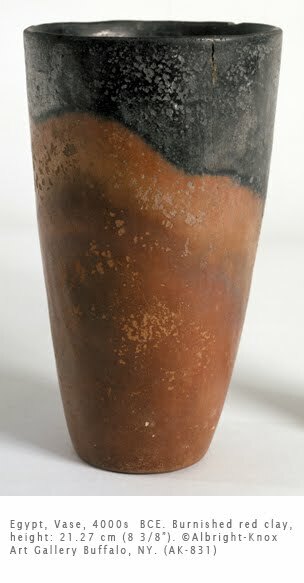 The black border, a typical feature of Badarian ceramics, was most likely the result of turning the heated vessel upside down in finely cut hay or wheat (chaff). It is not glazed, but was burnished (polished with a hot stone). In the Badarian sites, the separation of well-to-do graves apart from others lends credence to the idea of social stratification at this early period. Compare this to the work of Kitaoji Rosanjin (1883–1959), a Japanese genius of modern ceramics! Excellent blog, You cover relevant topics & I look forward to reading your new post soon.. I really appreciated the post.Thanks and keep up the good work.